A horses chest conformation is important to the horses ability to carry weight. A horse that doesn’t do well with draft work may be fine in harness or with a light rider depending upon the chest conformation of the horse. 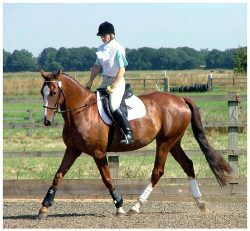 With the horse standing square, the width between the front legs is relatively narrow. However, this can be skewed by how far apart feet are placed at rest. A narrow breast often represents general thickness and development of shoulder. Narrowness may be from turned-in elbows which can cause toes to turn out, making the horse appear narrow. Narrowness in the chest may be from immaturity, poor body condition, inadequate nutrition, or under-developed breast muscles from a long time in pasture and lack of consistent work. The horse usually has undeveloped shoulder and neck muscles. The horse may tend to plait, and is more likely to interfere, especially at the trot. The horse with narrow breasted chest conformation, is best for pleasure riding, driving in harness, and trail riding. A horse with a pigeon breasted chest conformation will have front legs that come too far back under the body, giving a bulky appearance to the breast when viewed from the side. The front legs lie behind a line drawn from the withers to the ground, setting the horse under himself. Pigeon Breasted Horse Chest conformation is often associated with a long shoulder blade that drops the point of shoulder somewhat low with the arm bone relatively horizontal, setting the elbow more to the rear. Bulky breast muscles and legs set under the body decrease the efficiency of stride and swing of shoulders, hastening fatigue. It may interfere with the front legs, forcing them to move to the side rather than directly under the horse. It can cause a rolling gait that slows the horses speed, especially at the gallop. It should interfere little in the sprinting sports that need rapid acceleration. The inverted V of the pectorals are important for quick turns, dodges, and spins needed by stock horses. This horse chest conformation is most useful in Quarter Horse racing, barrel racing, roping, and stock horse sports where low front end crouches help the horse make quick turns. Use our horse health advice sections to make sure you are as knowledgeable as possible on the needs of your horse and to ensure its continuing health and wellbeing. Remember though, the information contained in the horse health advice section is no substitute for a professional fully qualified vet. And somewhere deep down inside I feel doxycycline tablet formulation very very lucky..